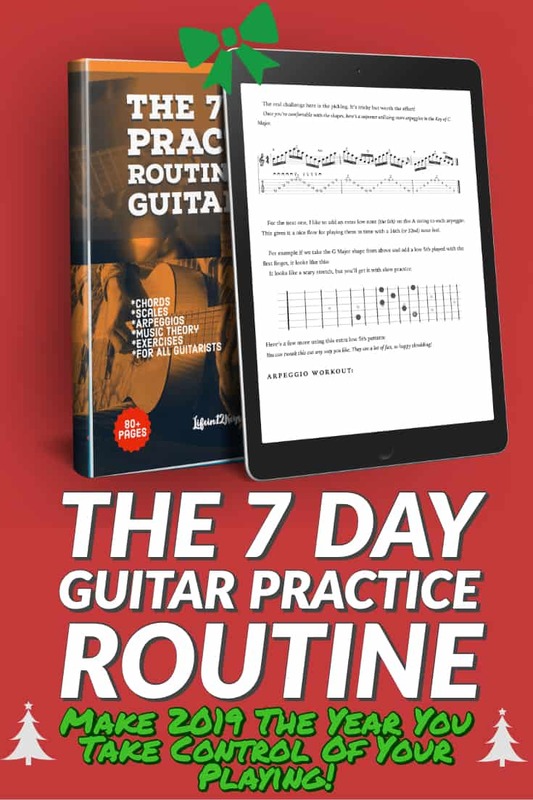 The full Book, “The 7 Day Practice Routine For Guitarists” is available now! 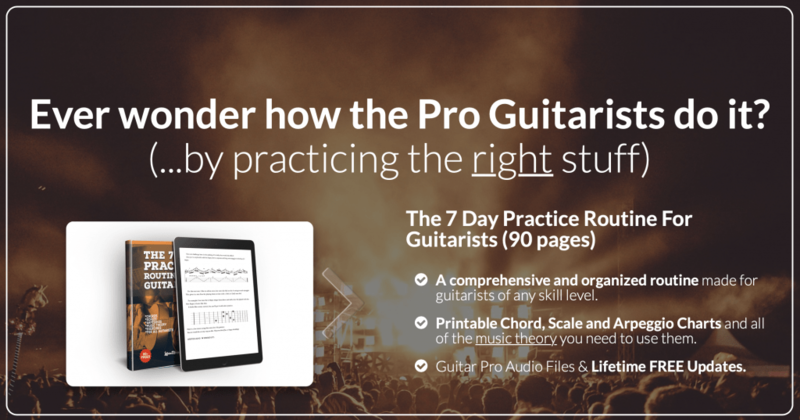 90+ Pages of Chords, Scales, Arpeggios and Music Theory for Guitarists. Printable Chord, Scale and Arpeggio Charts. Bach’s Bouree in E minor. A comprehensive 7 Day Practice Guide for Guitarists of any Skill Level. Printable Musical Examples in TAB & Standard Notation. 50% Commission Affiliate Program. I’ll pay you half of every book sale you refer. As a show of thanks to all of my readers and supporters, I’m offering a generous 50% commission on all book sale referrals. Signup to get your Affiliate Link here through Sendowl. 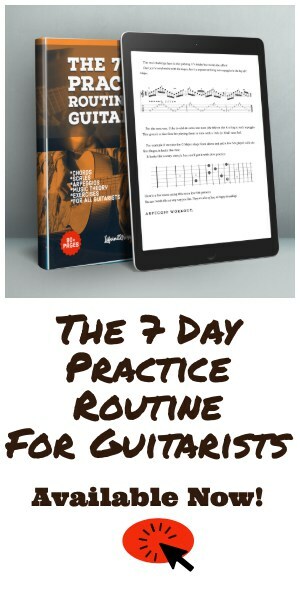 Who is The 7 Day Practice Routine for Guitarists for? Any Guitarist looking for a detailed, structured practice routine. Guitarists who want to know more about Music Theory. Anyone who wants all of the important Chords, Scale & Arpeggio shapes in one place. Any Guitarist stuck in a rut, looking for new techniques and ideas. Guitarists who want to improve their chops, FAST. Guitar Teachers looking for material supplements for their own students. Who is the book NOT for? Guitarists who are 100% happy with their technique. Guitarists looking for a “quick fix” miracle lesson. The routine takes work and some effort. Anyone not yet able to read some TAB. A complete beginner picking up the guitar for the first time. 1. What results will I get from this book? You’ll get a step by step process for going from where you are now to where you want to be with your playing. The routine is laid out in a straightforward daily outline that includes music examples and theory for each lesson. 3. What format is the book in? If your order directly from the website, you’ll get a high-quality, printable PDF file. I’ve done my best to include longer routines and music examples on their own page. Print only want you want. Music stand friendly! Note: If you purchase direct, you’ll also get free updates anytime I add or change anything in the routine. If you order on Amazon the book works on any Kindle or device with the Amazon Kindle App. It will look and function exactly like any other book you’ve purchased from Amazon! 4. How long will this course take? It depends! How much time per day will you work on it? How consistent will you be implementing everything you’ve learned? There are TONS of lessons for you to do, so it could take you two weeks or over two months to go through depending on your level of commitment. For beginning Guitarists, I recommend learning some of the shapes first. After that try to focus on 1 routine before moving on to the next. 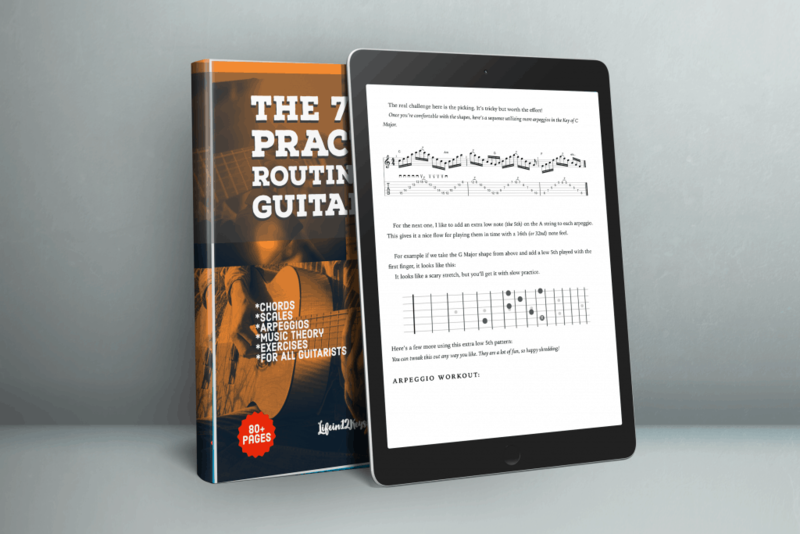 Advanced guitarists should be able to tackle 1 lesson per day as the book is laid out. 5. Is this book worth the price? If you do the work in the routine, it’s worth 1000x what you pay for it. If you don’t do the work, it’s not worth a penny. 6. Is my credit card safe? It is very important to me that your credit card is safe. I have partnered with Stripe (a third party credit card company) to handle all the billing and provide a secure encryption. This is as safe, if not safer, than using your credit card at a store or restaurant. You can also use your Paypal account! Paypal has been the industry standard for sending and receiving secure payments for 20 years. Just choose Paypal at checkout. Love the about the Author ! I’m going to buy the book just because . Keep up the great work Craig !!! Wow! That is a lot of material for such a great price! This is amazing! Thanks Sasha! Hope you like the book. I hope its ok to comment here. If not i will email you. I got the book last Monday and so far i really love it. I have a question about the arpeggios in Chapter 3. Working through te diatonic arpeggio shapes in D minor does diatonic mean I can move them into any key? For example what arpeggios would i play if i was in e minor? No problem Sylvan. Feel free to comment or email me anytime. If you have any more questions let me know. Glad you like the book! Great post! & congrats on the book! I’ll definitely repin it for when I’m serious again about learning how to play an instrument. Lol.